When a paradigm shifts, you cannot ignore change and count on past success. New technology, like the quartz in watchmaking, can revolutionize a market, creating a tectonic shift in accepted practice. The advent of the Cloud is such an advancement in technology and optimization of its capability - the new paradigm. Technological developments, constricted budgets, and the need for flexible access have led to an increase in business demand for cloud computing. Many organizations are still wary of cloud services, however, due to apprehensions around security issues. There is a real concern across the globe about the accelerated rate that companies are moving information to the cloud and the subsequent demise of physical boundaries and infrastructure. How organizations evaluate Cloud Service Providers (CSPs) has become key to maximizing that optimization. CSA STAR Certification has proven to be the security standard of excellence in the cloud security market. 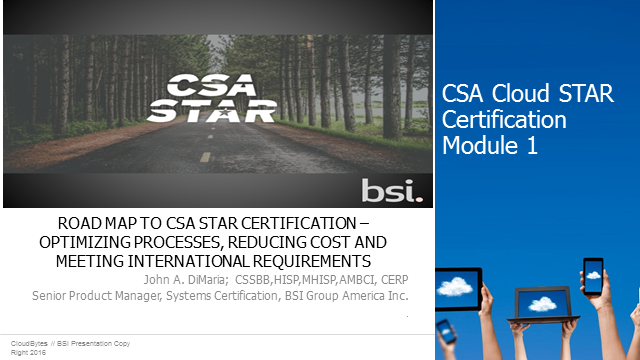 In this first of three modules being offered by the co-authors of CSA STAR Certification - The British Standards Institution (BSI) and The Cloud Security Alliance, you will learn the history behind the vison and take the journey down the road to the certification, but more importantly review data on how it helps organizations optimize processes, reduce costs and meet the continuing rigorous international demands on cloud services.